An article by Aaron Roberts from St. John's Vancouver, one of our parishes in that city. I recently took my daughter, Bea (pictured above), for her annual checkup at Vancouver General Hospital. 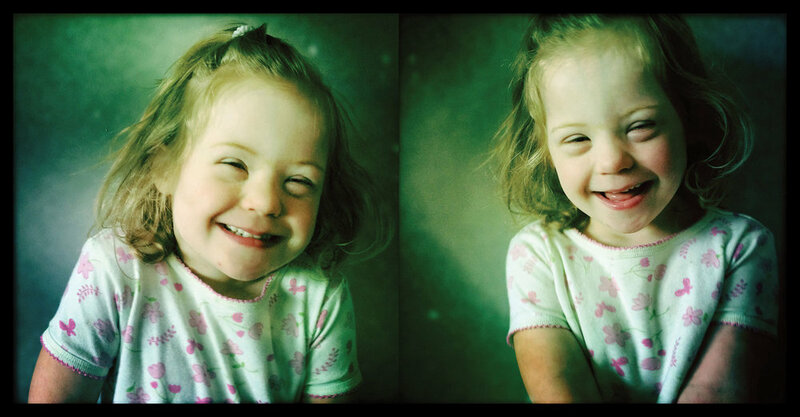 Bea is four years old and has Down Syndrome. She is used to doctors prodding and poking her, so she did well. As we left, I shared the elevator with a woman whose baby has the same condition as Bea. We made an instant connection and chatted for about 20 minutes in the foyer of the hospital. Toward the end of the conversation, she told me that at her previous visit she was scolded by an older couple for bringing this baby into the world, who told her, “She will be a burden on the economy.” My new friend and I traded several clever retorts that she could have made. It’s too bad the best responses always come to us after the fact. On that day, she didn’t have one. She just burst into tears and ran back to the nurses’ station. I am not sure if this woman was a Christian, but, as our conversation came to an end, I told her how precious her daughter was. I assured her that God had decided that she would be the very best parent for this little girl and then thanked her for being such a wonderful mother. Obviously, the couple who verbally assaulted this woman sounds awful; most people wouldn’t say that kind of thing out loud. And yet, most people who find themselves pregnant with a child with Down Syndrome end up choosing to abort. This decision is probably driven by fear or by a deep trepidation about suffering. I think the fear is understandable, but the actions that usually follow are not. During the “I am the 99%” protests of recent years a picture of a young boy holding a sign went viral. The sign said, “I may not be perfect, but I’m happy. I am God’s handiwork and bear his image. I am blessed. I am one of the 10% of children born with Down Syndrome who survived Roe v. Wade.” The sign refers to the statistic that around 90% of children diagnosed with Down Syndrome in utero are aborted. It’s for this reason that the teaching of Psalm 8 is so important. In it, David is struck by the value God places on human beings – despite the fact we are just tiny fragments of the universe. To be described as holding a position a little lower than heavenly beings’ is surely the highest honour possible for a created being. David says we are crowned with honour and glory: concepts normally used to describe royalty. And our job? Dominion over ALL creation. That’s god-like responsibility. David is taking us back to Genesis 1 and reminding us that God made us in His image, as the pinnacle of His creation. It’s on this basis that we value all human beings, regardless of their skin colour, age, the uniform they wear, or how productive they are in society. As God’s image-bearers, we are all equal in dignity and worth. The modern idea of human rights is built upon this exact idea. It was not created Ex Nihilo by the United Nations, the Enlightenment thinkers, or any particular government charter. Rather, it is firmly rooted in the Judeo-Christian worldview. "As God’s image-bearers, we are all equal in dignity and worth." So, if our society got its idea of human rights from the belief that all people are created in the image of God, what happens when we lose the God part of the equation? What happens to the world when human dignity is unhooked from its source in God? What is our basis for ascribing value to people? Well, it depends on whom you ask. The average person would probably answer that they are valuable because they are attractive or powerful, or sexually active, or wealthy. In the upper reaches of Western academia, there are people who are paid to think about such things, and they have developed more sophisticated approaches to thinking about human value. The secular academic approach to the question ‘what gives humanity worth’ revolves around what they term ‘preferences’. If someone can make choices and express preferences, then they are moral agents worthy of protection. "What happens to the world when human dignity is unhooked from its source in God?" On the surface, this might sound quite reasonable. However, taken to its logical conclusion, it results in the ideology of Princeton professor, Peter Singer. One example of Singer’s ideology is his suggestion that a period of 28 days after birth should be allowed before an infant is recognized as having the same right to life as others. This suggestion is based on the claim that pigs, chickens, and fish exhibit more signs of consciousness and rationality than newborn infants and people with mental disabilities. That, of course, is not what Christians believe. Our belief in human rights is grounded in the idea of the Imago Dei. But that grounding has now been discarded by our society. When you rely on the presence of certain capacities or some other trumped up approach to delineate and define which humans have worth, the circle of who is valued will get smaller and smaller. And the smaller it gets, the fewer people will be protected. This is why the teaching of Psalm 8 is so important. If it’s true that we bear God’s image, then we can’t glorify God while treating another person (God’s image bearer) with contempt. The reason we treat each other so poorly in our culture is that the relationship between human dignity and the Christian God has been severed. Abortion, racism, classism: these are all examples of treating the image of God with contempt. There are communities in the world that withhold education from women because they are women. Others marginalize the elderly or the disabled. All of this is treating God’s image with contempt: which is treating God with contempt. As Christians, we should actively be involved in opposing any attempt to devalue people. The earliest Christians knew this, and the way they lived it out had a profound effect on society. In their time, death by exposure was the common (and legal) way of dealing with unwanted children. The early church, because of their belief in the inherent value of human life, scoured rubbish dumps looking for abandoned babies to care for. In a society with no welfare net, this belief led those Christians to care for widows and orphans when no one else would. This is also why the church was so attractive to women and the poor: it was the only place in society where they were treated as equals.